It doesn’t matter if it’s scorching hot outside or a crisp winter’s day, a bowl of soup is always one of the most delicious ways to cram a huge range of nutritious ingredients into one serving. It’s also one of the quickest. Research by the National Library of Medicine has even shown that soup can help you lose weight, due to its high satiation power (i.e. it makes you feel full). Whether it’s a light, refreshing gazpacho or a chunky hearty stew, soups are healthy, comforting, and super-simple to prepare. We’ve put together three fast, foolproof ways to get your soup on; either throw them in a slow cooker, simmer them up in your lunch hour, or store them in the fridge for a workday fuel-up. The only question is which one to make first. Vegan, vegetarian and gluten free, this Cuban-tinged soup by Cookie and Kate doesn’t need an exhaustive list of spices to give it its vibrant, complex flavour. Plus, leftovers keep for four to five days - perfect to see you through the week. 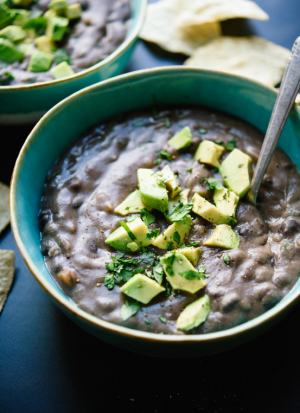 Black beans are are brilliant way to help your heart; full of fibre, potassium, vitamin B6, and phytonutrient content. This recipe uses canned beans, making the preparation process even quicker. And with carrots, celery, garlic, cumin, and a little bit of sherry vinegar thrown into the mix; it’s a mega quick way to pack in heaps of flavour and nutrients. Top with diced avocado for an even mightier health kick. 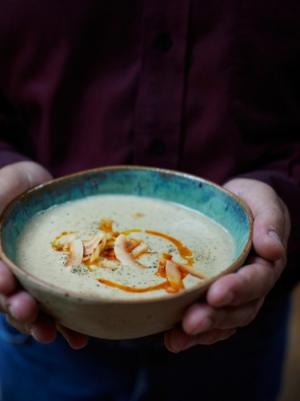 One serving of cauliflower contains 77% of your daily recommendation of vitamin C. That’s reason alone to eat the cruciferous vegetable - but you’ll be hard pushed to find a tastier way of serving it than this dairy free, gluten free, and vegan soup shared by Jamie Oliver. Cooked with coconut milk, it’s perfectly creamy without being too heavy. Add cinnamon, ras el hanout, garlic cloves, vegetable stock, and a glug of olive oil - then top with coconut flakes and chilli oil (if you like it spicy). 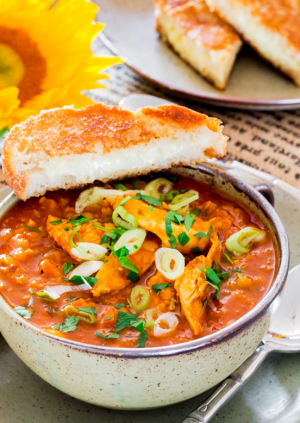 Loaded with lentils, chicken, cumin, turmeric and smoked paprika, this hearty chicken soup by Jo Cooks really packs a nutrient punch. Vegetables can be chopped up and thrown into a pot, with chicken broth, tomato paste, lentils, and shredded chicken added and boiled for half an hour. Not only are you lowering your blood cholesterol and upping your fibre and protein intake with all those earthy lentils, but chicken broth has been shown to decrease inflammation and boost your immune system. It also bumps up your bone density and is full of gelatin, which promotes healthy cartilage and soothes joint pain.